After 10 years of the successful Senior Dental leadership program developing the strategic leadership skills of 400 senior dental leaders, the Global Child Dental Fund charity has developed the Advanced Dental Leadership program. This program targets final year dental students and younger dental professionals worldwide, aiming to develop the leadership skills that will prepare the emerging generation of global dentists to perform in the increasingly competitive and evolving arena of modern dentistry. The program is structured around 20hrs of Continuing Professional Development (CPD) modules in oral health leadership, provide a verified certificate from the Global Child Dental Fund charity upon completion, is available in multiple countries and languages and costs £40 to sign up for all the interactive course materials. A subgroup of WFPHA Oral Health working group has been involved in this program making this activity one of the project sustained by the group. These professionals engaged in bringing their public health vision within the dental profession. The plan is to contribute to the program as well as to develop the teaching activities to further levels in the next future. 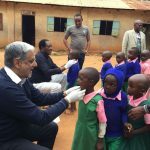 WFPHA has accredited the Advanced Dental Leadership program developed by the Global Child Dental Fund charity directly and through its Oral Health Working Group. The WFPHA recognizes the importance of this program in capacity building and increasing leadership in oral and public health in general. In 2016 the World Federation of Public Health Associations has accredited also Global Child Dental Fund’s new Online Advanced Dental Leadership Programme. This exciting programme develops medical nurses and allied health professionals into first class leaders and advocated for oral health. It will impart the essential leadership skills and oral health knowledge necessary to improve effectiveness of health professionals, develop understanding of key oral health components, and successfully integrate the two areas into daily practice. The WFPHA has recognised the importance of the programme in increasing leadership capacity in oral and public health. For more information please contact: Aneta Stanev.